Globally, 90% production of rice is in Asia, and Vietnam is third largest exporter of rice and by 2018 the total exports are expected to reach 6 million tons on account of growing rice demand from Southeast Asia, majorly from Philippines. Over the past decade Vietnam has increased its rice productivity and profitability and significantly reducing poverty. Government is seen to shift its focus from reducing the poverty towards emphasis on technology usage to eliminate labor intensive farming and thus impacting the growth in productivity of the farmers. Vietnam has around 8 million hectares of land under rice cultivation and it has an average yield of 3.5 tons per hectare. The consumption of rice is growing at steady rate as per the slow population growth rate, having domestic milled rice demand estimated in 2017 to be nearly 1.55 million tons annually. Average revenue from per person consuming rice amounted to USD 107.2 in 2017. Vietnam has poor climate condition in months of winter-spring, but the months of May-June are most suitable for cultivation of rice. Thus Indica rice variety demand produced in Vietnam spur up, boosting the exports of rice. Goldstein Research analyst forecast that the Vietnam rice industry is expected to grow at CAGR of 6.8% over the forecast period. Vietnam rice production was estimated at 44.1 million metric tons in 2017. The factors such as government support in rice production, favorable monsoons, rising number of rice processing companies, increasing exports are majorly impacting the growth of Vietnam rice industry. 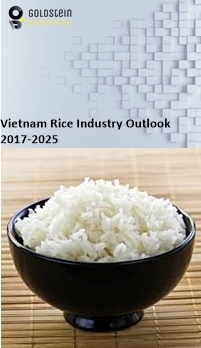 The report covers the present ground scenario and the future growth prospects of the rice industry for 2017-2025 along with the Vietnam rice production and revenue of Vietnam rice industry. We calculated the market size and revenue share on the basis of revenue generated from major players involved in rice processing across Vietnam. We have forecast the market on the basis of producers, suppliers and distributors, exporters and importers. On the basis of rice type, milled rice accounted for largest market share in 2017 with 80.3% of total rice production. Over the forecast period milled rice is expected to continue their dominance in the rice production backed by the highest domestic demand for milled rice. Further, Indica rice variety has huge demand from countries importing rice, thus over the forecast period it is expected to grow at a CAGR of 6.91%. Rice industry outlook 2017-2025, has been prepared based on an in-depth market analysis from industry experts. The report covers the competitive landscape and current position of major players in the rice industry. The report also includes porter’s five force model, SWOT analysis, company profiling, business strategies of market players and their business models. Vietnam rice industry report also recognizes value chain analysis to understand the cost differentiation to provide competitive advantage to the existing and new entry players. In the era of technology advancement, there is trend of producing genetically modified (GM) rice to ascertain the quality of rice and food security. Though commercially there is no production of GM rice, but many varieties have been approved for commercial production which is expected to boost the Vietnam rice industry. Rice is a staple crop for 70% of the world and thus the demand for rice is expected to continue to grow over the forecast period. The food security concerns all over the world is driving the growth of the Vietnam rice industry, which by exporting rice to various countries is contributing towards global food security and growth of rice industry. Vietnam Rice industry report comprises of the following companies as the key players in the Rice industry: DUONG VU COMPANY LIMITED, Sona International Company, SONG HY GIA LAI, DUC MINH CORPORATION, Sunrice Food Vietnam, DAI TRUNG NGUYEN CO., LTD, TVFood Co.,Ltd, TAN LONG GROUP JOINT STOCK COMPANY.